Say what you want to say about Michael Bay’s live-action Transformers films but you cannot deny that it is a box-office juggernaut that is here to stay. While the last movie Transformers: Age of Extinction and the second film Revenge of the Fallen were massive duds, I kind of enjoyed the first and the third movie as brainless popcorn flicks despite their shortcomings. Transformers: The Last Knight starts off with a flashback and reimagining of King Arthur and the Knights of the Round Table, in which Merlin’s ‘magic’ was gifted to him by a group of Transformers who have hidden themselves on Earth. This technology given was a grand contributor Arthur’s heroics and the parties involved made a pact to keep Transformers existence on earth a secret. 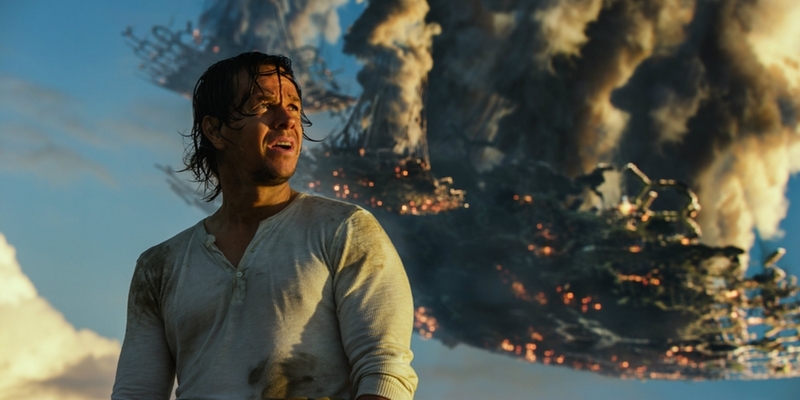 The movie then flashes forward to the aftermath of Transformers: Age of Extinction, where we see Cade Yeager (Mark Wahlberg) who is now a fugitive and has limited contact with his daughter. He now has and the autobots trying to survive without Optimus Prime (Peter Cullen) who left Earth to find his creator. They are now fugitives and on the run from Transformers Reaction Force- a global human organization that is dedicated to hunting and destroying Transformers regardless of whether they are Autobots or Decepticons. Optimus Prime ( Peter Cullen) and Bumblebee duke it out !! During one of their routine missions they find Izabella (Isabela Moner), a young girl who was orphaned during the climatic battle that took place in Chicago (this happened in Transformers: Dark of the Moon) . During the rescue mission they Cade meets an ancient Cybertronian, who with his dying breath gifts him with a mysterious talisman that has a connection to the transformers’ secret history on Earth over the ages and the earth itself. This discovery gets the attention from astronomer and historian, Sir Edmund Burton (Anthony Hopkins) who is a member of a society that is dedicated to protecting these secrets. He also enlists the help of Viviane Wembly (Laura Haddock) a professor at the university of Oxford who is not aware she has a huge role to play in the battle coming ahead. Whilst they learn about what is coming ahead the TRF strike a bargain with the Decepticon leader Megatron (Frank Welker) and his fellow Decepticons to strike down the Autobots during their mission to find the secret technology that can save or destroy the planet humanity and Transformers-kind alike. The Last Knight is marked as the last time where Michael Bay will take helm as the director (assuming they don’t give him a briefcase of dollar bills) and the last time Mark Wahlberg and Josh Duhamel (who has been in the series since the first film) act in a transformers movie. It is also acting as a launch pad to a second phase of films and spin-offs plotted by the Transformers writers group to expand the live-action series of films into another full-blown cinematic universe. With that said is The Last Knight a good enough film to remove the sour taste that Age of Extinction left in our mouths and finish Bay’s run with the legendary Hasbro franchise with a bang? Cade Yeager (Mark Wahlberg) looks on. One thing you can never take away from Michael Bay is the fact he is a gifted director from a technical perspective. The movie comes at you with rapid editing, great visuals, good CGI, explosion-fuelled sequences and flashy set pieces that ultimately overshadow his story-telling ability (which isn’t great depending on who you ask). I enjoyed the fight scenes and chases with the fancy cars even though the scenes don’t really have a lot of substance backing it. It’s not perfect as the movie IMAX 3D visual effects aren’t too great and haven’t shown signs of improvement since Dark of the Moon. Mark Wahlberg puts in a solid shift as Cade Yeager and his performance isn’t as annoying as his last one where he had to constantly remind everyone that he is an inventor. Josh Duhamel who has been in all movies gets a good shift and his character gets presented with an interesting dilemma. He’s fought alongside with the autobots but this time round he has to hunt them down because it his orders to do so. It’s probably one of the most interesting sub-plots to come out of the human element in Bay’s movies but unfortunately the movie doesn’t explore this avenue to its potential, which is a massive shame. 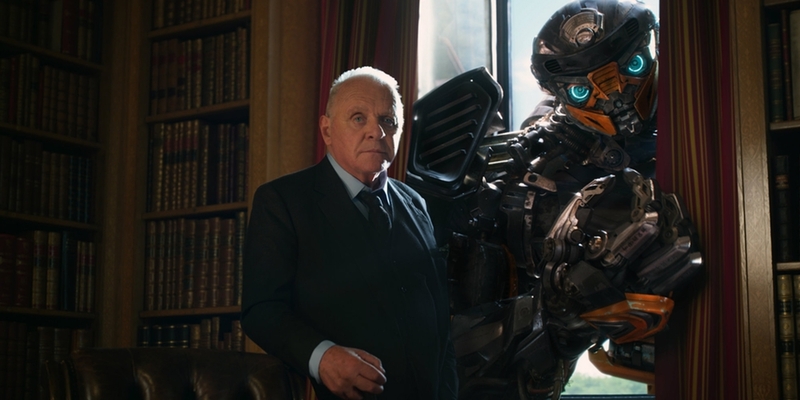 Sir Anthony Hopkins is without the best addition in this movie. Even though his character is mostly used as a vessel for plot exposition, he is very entertaining and provides some of the film’s best jokes something that a lot of human characters in this series of films have failed to provide. Laura Haddock was also a good addiction as she is the film’s vixen of sort but is way classier than the others that have come before her and she actually has an integral part in the plot even though the movie doesn’t execute that point of difference smoothly. Despite all the film’s dazzling effects and sharp cinematography, this film doesn’t take massive risks like the Fast and Furious franchise did when it reached its 5th iteration and ends up being another by-the-numbers Transformers film. This means that the film narrative formula is once again boiled down to the Autobots and Decepticons fighting for an identifiable McGuffin which in this case is Merlin’s staff; the movie is also ripe with a lot of expositional dumps; a massive focus on human characters who are massively un-developed and quite irritating for the most part; insulting stereotypes, lewd humour and a seriously attractive female who acts as nothing but eye candy for perverted members of the audience and countless amounts of explosions. If you are expecting something different this time round prepare to be disappointed. While I appreciate the film’s attempt to expand its mythology the movie still feels shallow. This is attributed to the fact that none of the previous movies have set up what takes place in this movie. This gives the movie the unfortunate task of keeping the audience up to speed and since it is a two and half hour movie, the movie can only relay this information through scenes of people talking about it and not showing it. 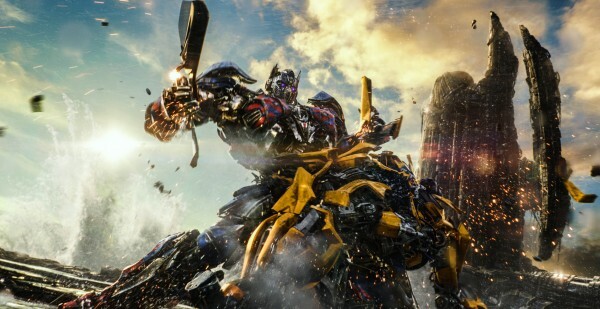 The movie once again misses the opportunity to characterize and fully develop the autobots and Decepticons but once again uses them as vehicles (no pun intended) for the action-sequences, crude humour and horrible stereotypes which exemplified through characters like Hot Rod (Omar Syd) who speaks with French accent, Cogman (Jim Carter), a transformer who aids Burton and plays the English servant stereotype to a tee and Drift (Ken Watanabe), an autobots who exhibits Japanese stereotypes. There are a lot of transformers in this film and I can guarantee you that if you are not a die-hard fan, you will struggle to remember a lot them. Only Bumblebee has a significant presence throughout the movie and he is once again left to play third wheel to a human guy and girl who are coerced into an unconvincing romance (it is literally forced), which in this case is Wahlberg and Haddock. Even the great Optimus Prime a small amount of screen-time in this film and is only there for its climatic set piece. The film’s promotional material suggested that the film will flip the script and depict him as a villain for unknown reasons but even there it only takes the film two minutes to resolve that which is extremely disappointing. Though Anthony Hopkins was easily the best performer out of the film’s newcomers same cannot be said for many of the others like Jerrod Carmichael who is relegated to Cade’s jumpy assistant who despises the Feds who’s attempt at providing levity is appalling and the 14 year-old girl Izabella who literally adds nothing to the movie other than being a kid-sidekick and is pushed out of the way to make room for Haddock’s character. Probably the biggest offender of the lot is Tony Hale who plays an unnamed JPL engineer that gets a decent amount of screen-time to be telling the audience that the autobots strategy isn’t better than applying physics. Transformers: The Last Knight is a better effort than its predecessor but it’s unfortunately a hollow, loud and formulaic action flick that refuses to grow up with its contemporaries and it also one that ultimately fails to shake things up.